We have been so lucky to find a source for profile images, and made profiles for 93 different cameras. The advanced profiles are more detailed than a simple matrix operation, which is the base of the “simple” profiles that are already present. This should hopefully give more faithful color reproductions for most cases. You can try out the new profile by installing the Rawstudio daily (which also includes other goodies). If you cannot install the daily or wait for Rawstudio 2.1 to try them out you can download them from here, or simply pick the one for your camera here in the subversion repository. Unpack the profiles into “(home)/.rawstudio/profiles”, and they should be picked up if you are so lucky to have a supported camera. If you want to tinker around with them, and have access to a Windows or Mac based computer, you can pick up the free DNG Profile Editor, and download the recipe from here. You will also need to convert your test images to DNG, for that pick up the (also free) DNG Converter. All of these are also rumoured to work under WINE, but if you try, do tell us your experiences below. You might have to re-calculate the whitebalance, since the camera to white calculation might be slightly different in some profiles. [*] To re-calculate the camera whitebalance use the ‘c’ key. This should only be an issue if you change the profile. If you have the advanced profile set as your default the whitebalance will be calculated from that. As always, feel free to share your experiences. 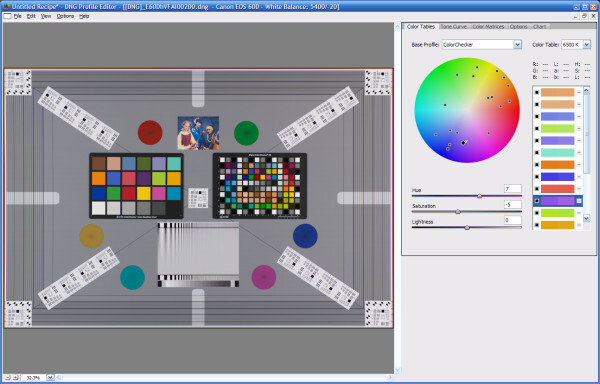 Thanks to Imaging Resource for making colorchart RAW files available. [*] Rawstudio stores the Kelvin Temperature and Tint, and not the adjustment resulting from this being run through the profile base matrix. You feedback is of course welcome, but the difference would of course be that changing this would have the temperature jumping back and forth when you change profiles. Just for funsies I did a profile using the small chart that is available there. If you like it, I will add it to the package! I wish I could try, but rawstudio-daily crashes, if I choose an advanced profile. BTW I miss the ability to delete certain custom profiles I have added in rawstudio UI. As for Pentax K-x, the advanced profile seems to produce noticeably different white balance than the corresponding simple profile. I don’t know, if that is in purpose. I miss the ablility to emulate camera white balance settings in Rawstudio i.e. easy presets for daylight, cloudy, tungsten etc. that I can choose to reset settings by. what about performance? you mention it’s not a simple matrix profile anymore, so are these LUT-based? i know traditionally you’re very concerned about the speed of your programs, so i assume you’re not simply running this through lcms2? The these DCP profiles have a 3D LUT in ProPhoto HSV space. Most of them are 90x25x1, so effectively a 2D LUT, for which we have a special case. So with interpolation there are 2 lookups/pixel, since two values in the horizontal domain are always adjacent. With 3 adjustment values per lookup that gives 90x25x1x4x4 bytes for the lookup table which is 36k. When using SSE2 this must be multiplied by 2 to avoid cacheline splits, so we end up with about 70k lookup data. This will mostly fit into CPU cache level 1. Real 3D LUTs require 4 lookups/pixel. Again most profiles fit within L1 cache. In real life, there isn’t any noticeable difference between using a profile with LUT and not, and we are able to hide most of the lookup latency with calculations, since we are processing 4 pixels in parallel. You can of course have a look at the code here: http://rawstudio.org/svn/rawstudio/trunk/plugins/dcp/ – see “huesat_map” (slow C code) and “huesat_map_SSE2” in their respective files. Just got a Pentax K30. It outputs DNG raw files. The profile I have uploaded is called PENTAX_K-30-simple. I had thought that DNG files offered some kind of standardisation to enable every aspect of a camera’s raw images to be understood by a raw editor. But it seems, still, that each camera needs it’s own profile. Is this correct and am I using the best profiel for the K30 or is there a better way of making use of the DNG files? Is it possible to include Advanced Profile for EOS 650D too? Just let me know if I can help on that. I have the camera and the CD that it comes with. Good point. I have just downloaded images for 30+ new cameras, including the 650D. I couldn’t get the colour to look right with sRGB etc. until I finally found this page and used the D5100 profile. Great work! Will you provide a color profile for new sony A7/A7r as well? I have been loving RawStudio for about 2 years now, using it with Canon 30D and 5D mk2. However the 5D mk2 recently died, and I could afford the 6D, not a 5D mk3 at 2x price. All my RAW (.cr2) files seem fine until I click on the thumbnail to work – and the photo gets a green hue. I have try to add profiles in form of recommended xml files, no change. This is very urgent please. My only other option is to find another RAW software that I like, and RawStudio is so easy and excellent. Hmm I am having exactly the same problems when I upgraded from the mk2 the 5d mk3 I have a green hue just like you explain I would love to know if there is a fix for this.